Alastair James Chisholm is a native of Dumfries and Galloway in South West Scotland where the family goes back to at least 1800. He grew up in Scotland but at the end of the 70's moved to Holland on contract and has stayed in the Low Countries ever since. His good wife Brigitte is Belgian and their two children William Alexander and Jennifer Anne are an interesting blend of Belgian and Scots; they are currently working in Brussels. He has recently retired after working all his life in IT, and is now reviving old interests including web development, philately and family history. He currently helps out as volunteer webmaster with a conservation group in Brussels and occasionally does work weeks with Trees for Life and the National Trust for Scotland. 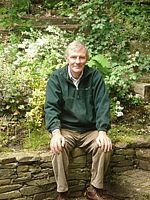 Alastair joined the Clan Chisholm Society a few years ago after getting interested in family history and has developed a fair family tree back to 1800 from GROS records, but like many people is finding it difficult to progress any further. Don't hesitate to let him know of changes or updates you propose.